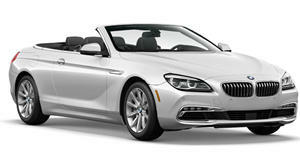 AC Schnizter reveals their tuned 540hp BMW 650i Convertible ahead of its Frankfurt live debut. The guys over at German tuning firm AC Schnitzer have been busy. On the same day they revealed their newly tuned BMW 1 Series M Coupe, they also unveiled their interpretation of the new 650i Convertible. The tuning package consists of a performance upgrade from the standard 407hp to 540hp, allowing the car to go from 0 to 62mph in just 4.4 seconds with a top speed of 192mph. This is thanks to a new exhaust system and a re-mapped ECU. There&apos;s also a set of upgraded brakes consisting of 8-piston high-performance calipers on the front axle, along with new a spring kit and a choice between 19-, 20-, and 21-inch wheels that provide for better handling. Other upgrades include a new body-kit featuring a redesigned front spoiler and a rear skirt protected by a special foil. The interior also hasn&apos;t been untouched, with it being now trimmed in a matte space grey and featuring a sports steering wheel, floor mats, and AC Schnitzer "Black Line" aluminum covers for the iDrive controller, foot rests and pedals. Official pricing hasn&apos;t been released, but we&apos;re expecting further details in a few days at Frankfurt.